William Britain, W. Britain or simply Britain’s, has been synonymous with toy soldiers since 1893. 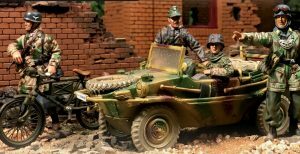 The company produces toy soldiers and military miniatures with attention to detail, quality and authenticity. Each model figure is cast out of metal and hand painted to the highest possible standards. Product range includes traditional toy style figures in 1/32 scale (54mm / 2.125″ tall) and a large selection of realistic matte finished figures in 1/30 scale (58mm / 2.3125″ tall). Most major time periods are covered from the eighteenth century up to the conflicts of the twentieth century. For collectors, Britain’s maintains that connection to the past by reproducing a few original designs as Archive figures, respecting the roots of their metal soldiers with correct historical details that are perfect for pristine parade ground vignettes. Their product line is available from a number of sites, including Amazon.